These algorithms are either non-preemptive or preemptive. 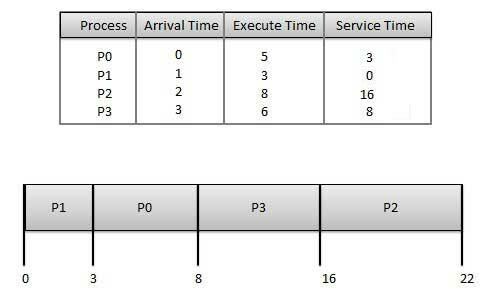 Non-preemptive algorithms are designed so that once a process enters the running state, it cannot be preempted until it completes its allotted time, whereas the preemptive scheduling is based on priority where a scheduler may preempt a low priority running process anytime when a high priority process enters into a ready state. This is a non-preemptive, pre-emptive scheduling algorithm. Easy to implement in Batch systems where required CPU time is known in advance. Impossible to implement in interactive systems where required CPU time is not known. The processer should know in advance how much time process will take. 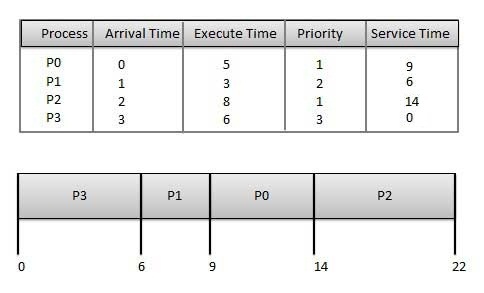 Priority scheduling is a non-preemptive algorithm and one of the most common scheduling algorithms in batch systems. Each process is assigned a priority. Process with highest priority is to be executed first and so on. Processes with same priority are executed on first come first served basis. Shortest remaining time (SRT) is the preemptive version of the SJN algorithm. The processor is allocated to the job closest to completion but it can be preempted by a newer ready job with shorter time to completion. It is often used in batch environments where short jobs need to give preference. Round Robin is the preemptive process scheduling algorithm. Each process is provided a fix time to execute, it is called a quantum. Once a process is executed for a given time period, it is preempted and other process executes for a given time period. Context switching is used to save states of preempted processes. 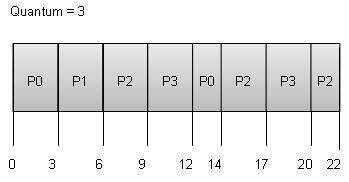 Multiple-level queues are not an independent scheduling algorithm. They make use of other existing algorithms to group and schedule jobs with common characteristics. 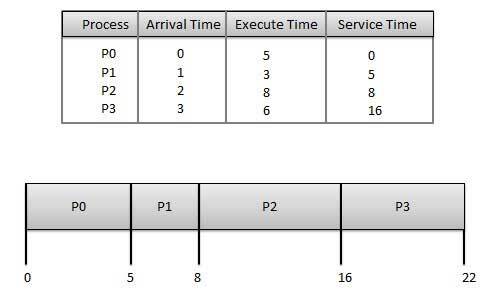 Multiple queues are maintained for processes with common characteristics. Each queue can have its own scheduling algorithms. Priorities are assigned to each queue. For example, CPU-bound jobs can be scheduled in one queue and all I/O-bound jobs in another queue. The Process Scheduler then alternately selects jobs from each queue and assigns them to the CPU based on the algorithm assigned to the queue.